We wrapped up the dealer training part of our Lie Nielsen visit today with a morning trip to the workbench shop facility, which is offsite from the rest of the Lie-Nielsen factory and offices. 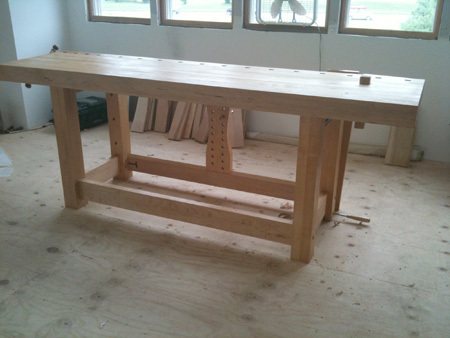 Lie-Nielsen workbenches match the rest of the products they build, in that they are extremely high in quality, and very nice to look at. Darren Gilbert manages the workbench shop, and he showed us around, giving us the overview of the machinery and detailing the process of building a Lie-Nielsen work bench from start to finish. 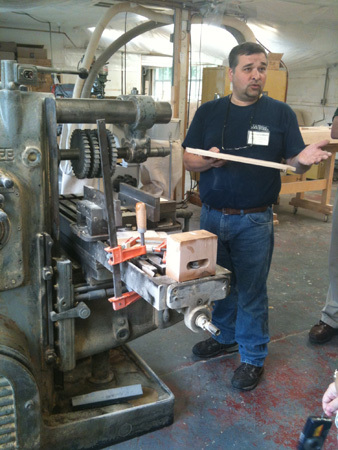 We returned to the main Lie-Nielsen factory in time for the beginning of the Open House, which featured demonstrations, presentations, a “Know Your Wood” test (in which your blogger was less than successful, but she is learning!) 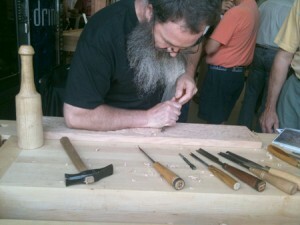 and many opportunities to look at and play with the gorgeous collection of Lie-Nielsen hand tools. Some of the demonstrators included Rory Wood from Rare Woods USA, who showed us some beautiful woods he has harvested from all over the world, and tested our knowledge again of what each wood looks like. One of the folks from The Woodturning School gave some great demonstrations of woodturning, producing tops and goblets with ease. Peter Follansbee of the Plimoth Plantation in Plymouth, MA gave an excellent carving demonstration and familiarized us with the catchy phrase “The Minute you Hit it”, to refer to committing to the cut you are making in the wood. Michel Auriou from Auriou rasps was hand making a rasp right on the open house floor – a really impressive and detailed process that was very enjoyable to watch. 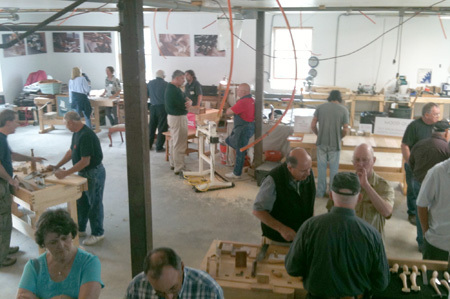 Reps from Connecticut Valley School of Woodworking and the Center for Furniture Craftsmanship, as well as the Carpenter’s Boatshop along with many others were there to promote their fine schools and answer questions. Chris Becksvoort is holding a workshop class Saturday and Sunday for those lucky enough to have registered early. On our way home from the open house we stopped by the Center for Furniture Craftsmanship to look around their gallery – they currently have a faculty show on, and the items they displayed were quite stunning. If you are in the area, we definitely recommend a visit! Lie Nielsen and his folks are such a class act, in the true sense of the words. 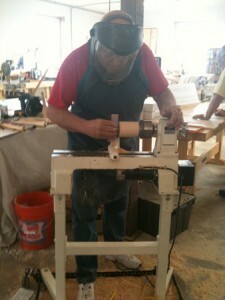 It’s a pleasure, and I feel extremely fortunate, to own several of their tools.